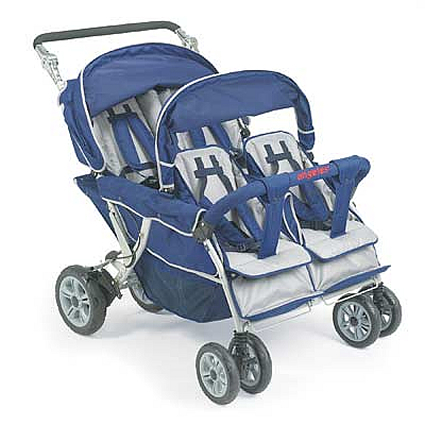 Bye Bye Buggy USA is pleased to offer you two different models of Angeles Bye-Bye Strollers. These lightweight vehicles are an ultra-convenient way to transport groups of your smallest kids — strong yet portable, these strollers fold up when you need to collapse them. 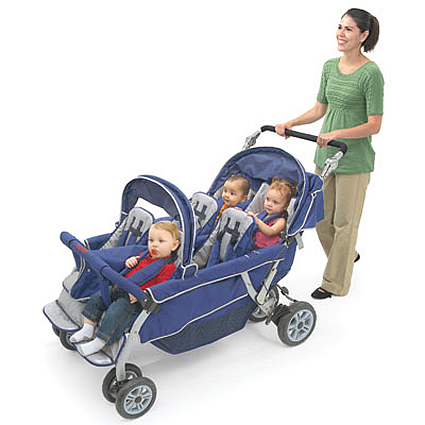 The Bye-Bye Stroller is available in two models: the 4-seater and the 6-seater. Angeles is known for manufacturing tough, long-lasting products. Best of all, the Bye-Bye Stroller folds up for easy storage. We deliver the Bye-Bye Stroller to your door anywhere in the USA. Order 1 today, and take your kids out for a spin! Or order a fleet of 3 or more and qualify for the Bye-Bye Stroller bulk purchase discount. For Bye-Bye Stroller features, see below. 3-year guarantee on every Bye-Bye Stroller! Please note that these strollers require full assembly. Unfortunately, they don’t come ready to roll right out of the box. It’s not rocket science, but you’ll need to roll up your sleeves. In the States of Maryland and Virginia and the District of Columbia, we can assemble these items for you, at a minimal charge. Or just fill out the Contact Form on the right-hand side of the page.